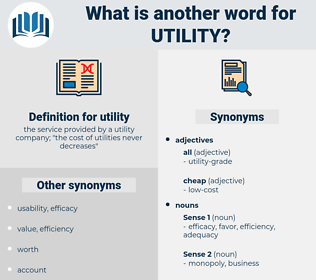 What is another word for utility? 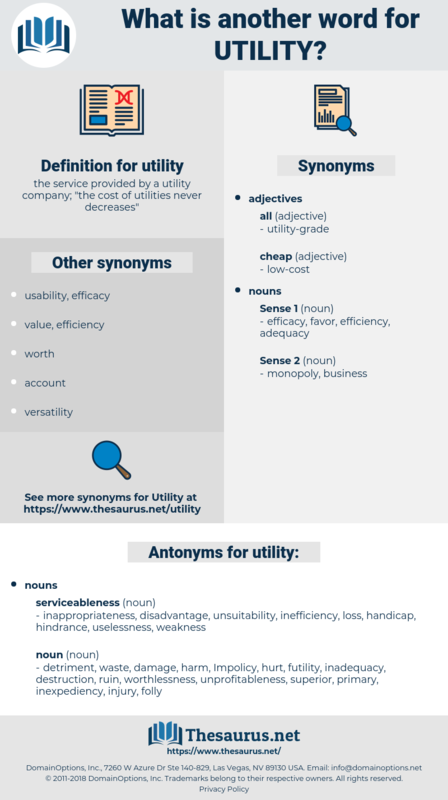 the service provided by a utility company; " the cost of utilities never decreases"
desirability, meaningfulness, hydroelectricity, interest, applicability, helpfulness. inappropriateness, disadvantage, unsuitability, inefficiency, loss, handicap, hindrance, uselessness, weakness. detriment, waste, damage, harm, Impolicy, hurt, futility, inadequacy, destruction, ruin, worthlessness, unprofitableness, superior, primary, inexpediency, injury, folly. Tribute was offered to him, but he refused to accept any part of it for his personal use, and applied it to a work of public utility - the repairing of the ancient canal of Borsippa, which had become nearly filled up. The morning I left New York there were not thirty persons in the city who believed that the boat would ever move a mile an hour, or be of the least utility. heating, heating plant, electrical plant, plumbing system, heating system, heat, plumbing, electrical system.